The Echo Bender is a mix of multi FX pedal and noise maker. It can process external signals like guitars, keyboards, mics and drum machines or it can create complex sounds on its own. -These modes can be used on their own or it can all be mixed together to achieve effects ranging from melodic and dreamy to chaotic and screamy. The noise generating capabilities are especially interesting. 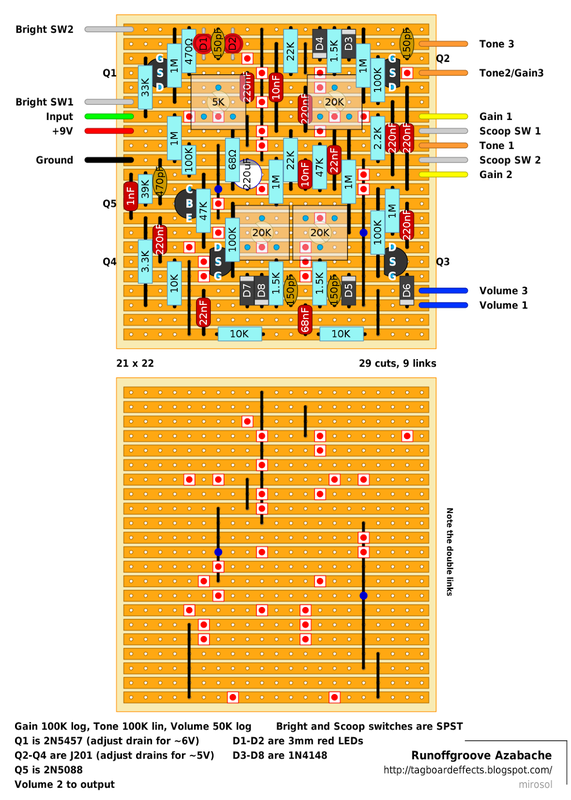 The echo rate range has been set much lower than the standard echo pedal. When the rate is turned WAY down, the sound breaks up into blipping squeals and screeches. Combine this with distortion and feedback tones and a reverse decay setting and you’ve got a lot of variety and tonal complexity. 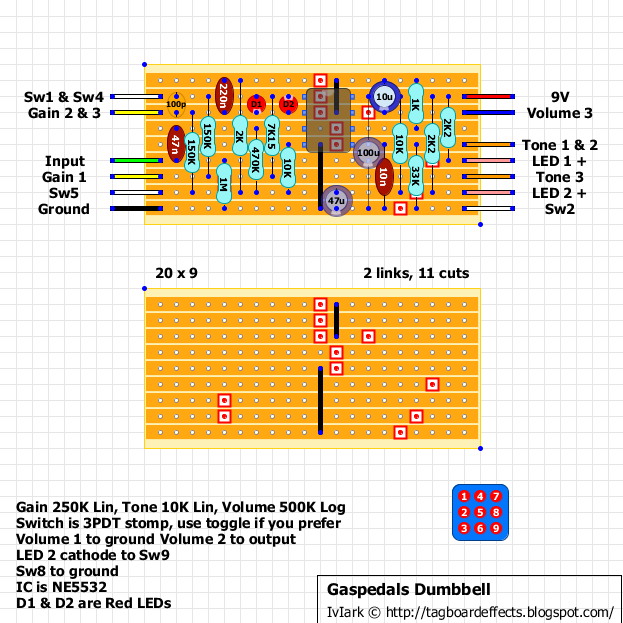 Video demos and additional information on the Casper Electronics site. And according to discussion below (and the ROG post on DIYSB), the excessive treble content on the tone control can be cured by just lowering or shorting the 47K resistor at tone pot lug 1 connection. So here's a "fixed" version of the layout. I used 4K7 for this resistor, which should be low enough to achieve better tone control. 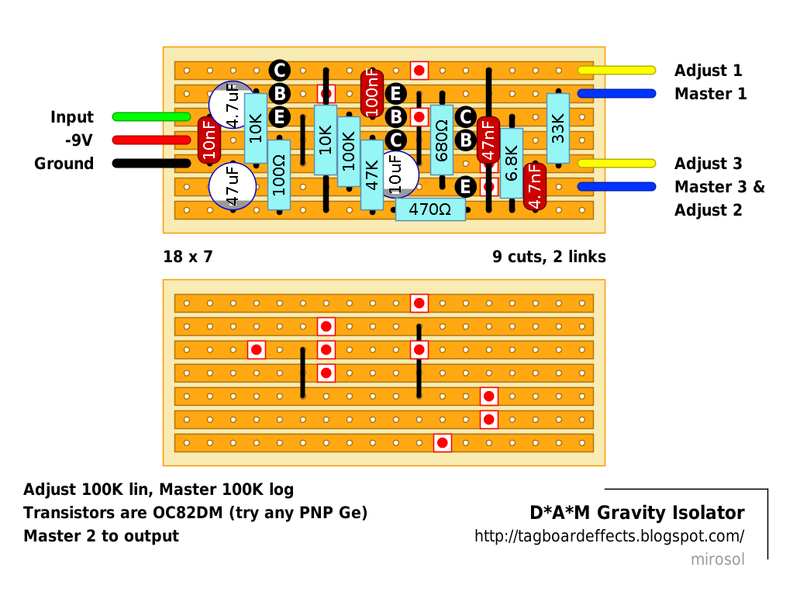 But you can go even lower or replace that resistor with a link if you want to. I never thought i'd draw up a Behringer original, but once i saw this it just made sense. 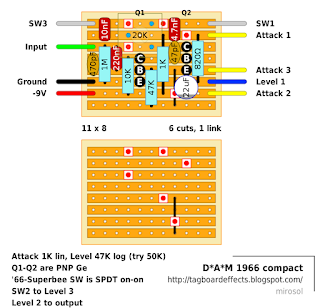 IC pinout is matching the TL074, as there's not that much easily obtainable info around about the original "Coolaudio Quad Opamp". 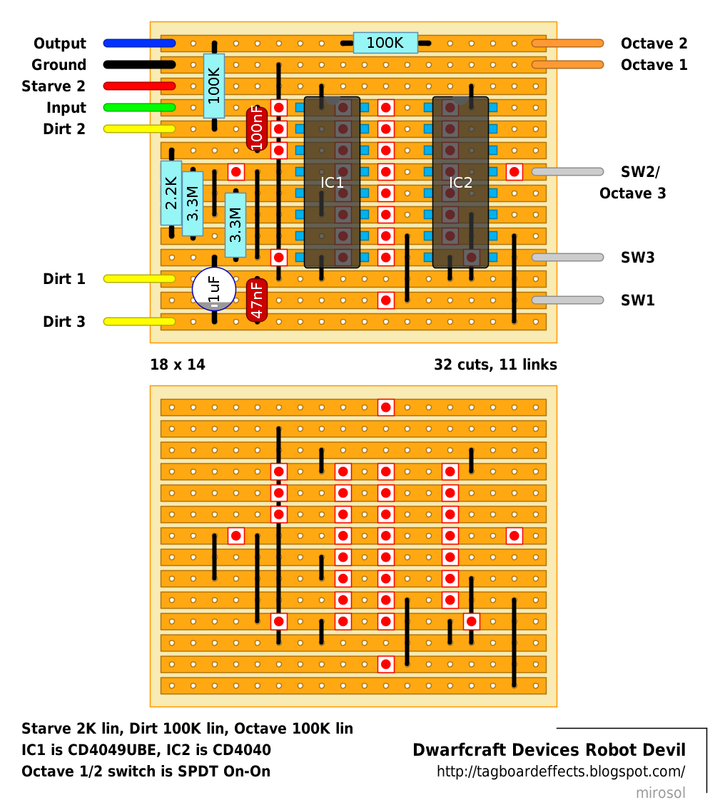 I'm just guessing that the pinout matches with TL074. Anyway.. 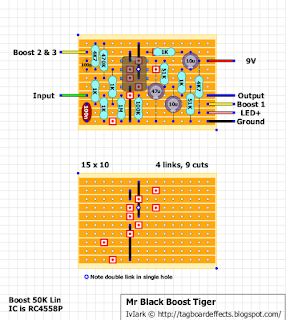 This is quite nice and relatively simple 9V tube circuit. You should probably try out other pin-to-pin equivalent tubes in there too. Olav's relentless requesting took a few things before i got it done. 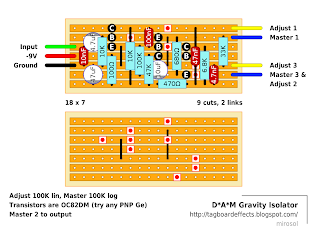 First, he stated that he's happy with the PCB layout he found on the internet. :) And about four months. Told you it was going to be huge. Transistor pins are once again made for modern everyday transistors like 2N3904, 2N5088 and so on. 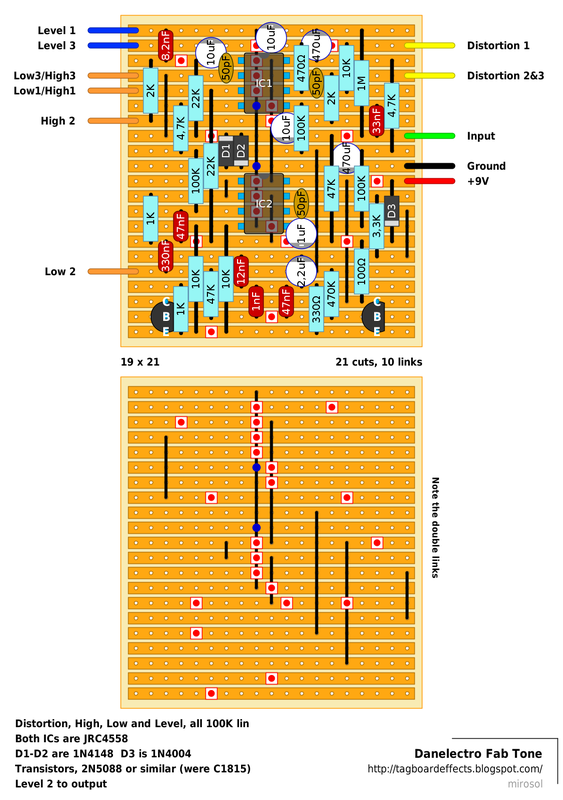 Original unit has 2SC2240s in it, so if you want to use those, just mind the pinout. Anyway. Here it is. Let's just hope it is correct. And happy easter for everyone! Since we're having a streak of big boards... :) Guess i'm getting old too since it's been over 15 years since this appeared on the marked.. 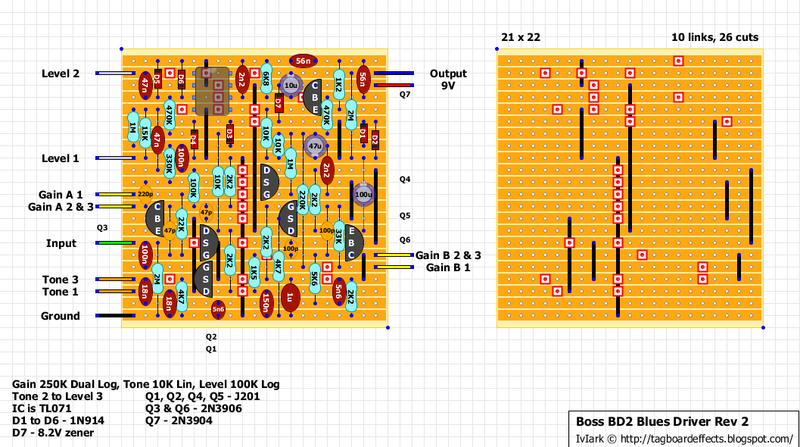 This layout is without the input, output and switching buffers. Should still go nicely in B box. 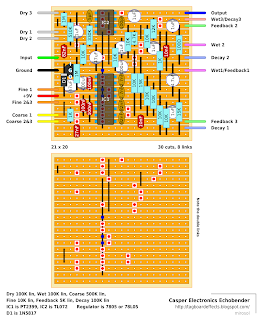 The transistors were 2SC1815GR on the original, but i've tweaked the layout to accept more commonly used pinouts. 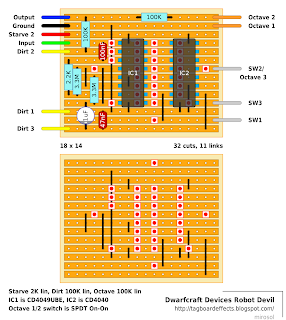 If you want to use the original ones, just mind the pinout. 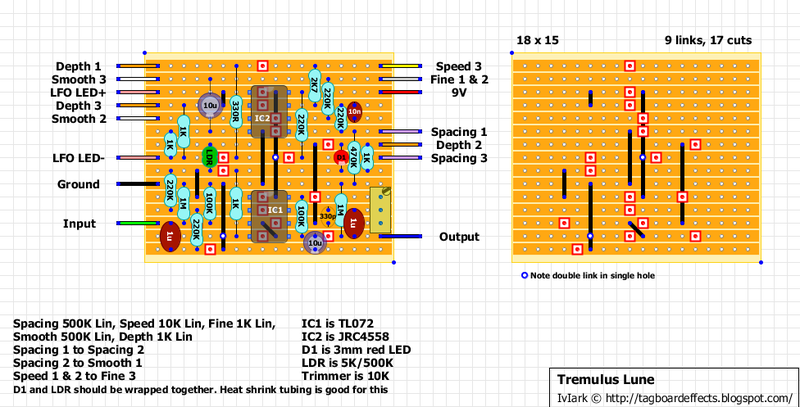 There's room to get the BCE transistors in neatly. But you should be golden with any NPN, like 2N5088, 2N3904, BC549 or BC550. Fab distortion from the Tube Pioneers. As requested. 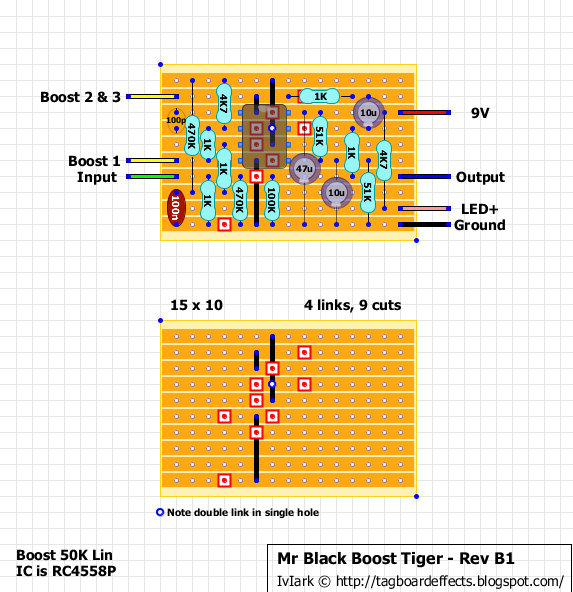 Paul Nelson's Orange Graphic MKII stomp box adaptation. 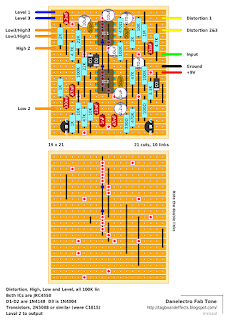 I knew this one will get huge the minute i saw the schematic, but it turned out a lot more compact in the end. Even got it nice and relatively symmetric. The FAC switch is a 2 pole 6 position rotary. 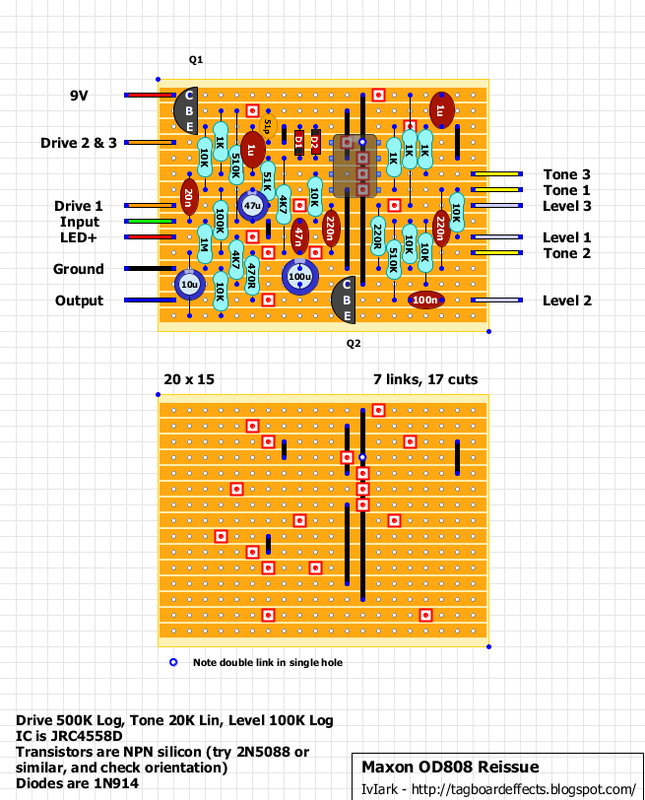 If you're not familiar with how to wire those, check out Mark's layout for Rangemaster with switchable input caps to get a hold of it. 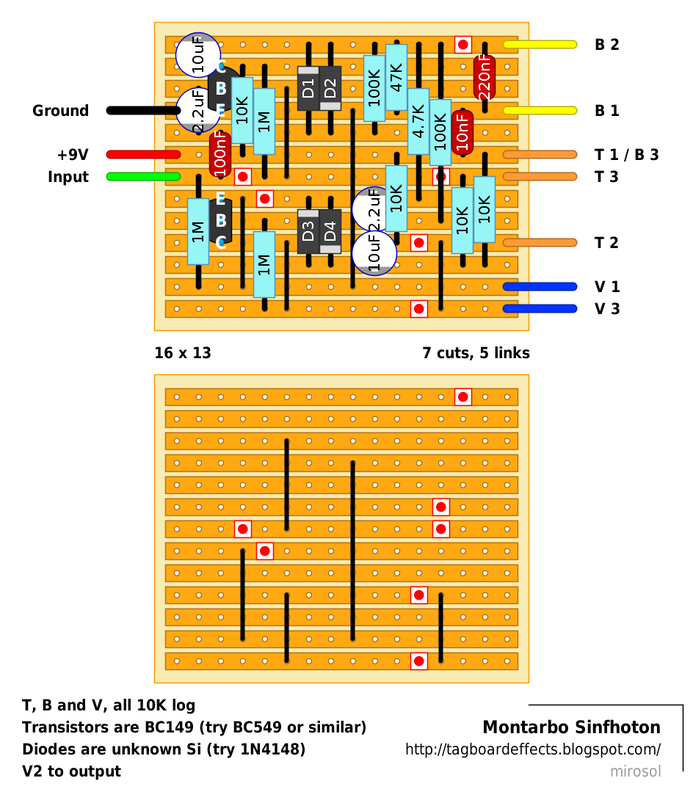 2N5457 and J201 were suggested for transistors, but you could try out any JFETs you like. 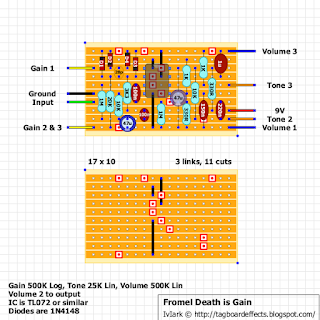 Trimmers are used to set the the Drain voltages for ~4.5V. I've tweaked the FAC cap values for not chaining all the caps after each other, so that part is not 1:1 with the schematic, but the values should be close enough. 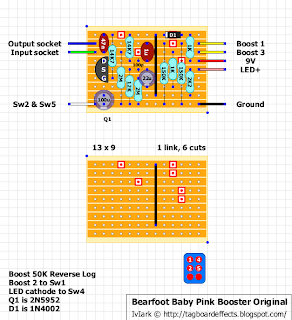 The Baby Pink Booster is a booster with clean transparent boost and very fine Line Driver in bypass position. It sports adjustable and switchable boosts ranging from unity to approximately 8 times or +18 dB, which is the practical limit with the signal levels and supply voltage range used in conventional effects-empirically derived. 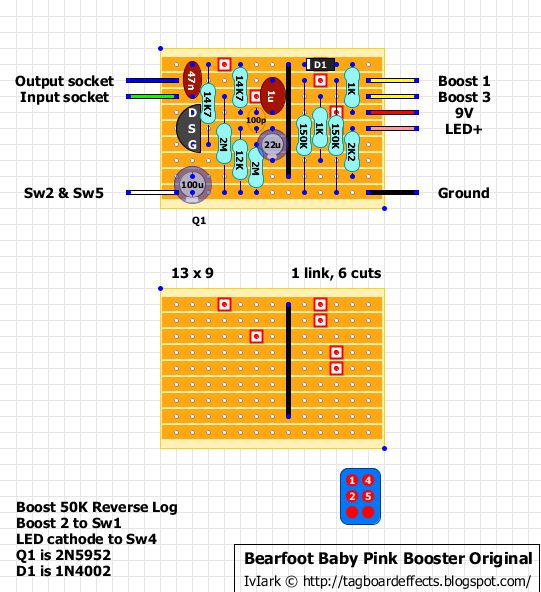 Baby Pink Booster was designed to do just the transparent natural clean boost, there is no overdrive or distortion options, to include an overdrive with Clean Boost one would have to compromise one or the other, we recommend Baby Blue OD or Dyna Red Dist for distortion. The unit doesn't have even Tone knob because it doesn't alter your tone, it just boost your signal and doesn't color your tone at all. 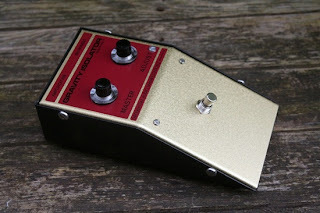 And with it's 180 degree phase bend you can even use it to connect the two channels of your vintage Fender amps (more about this later). 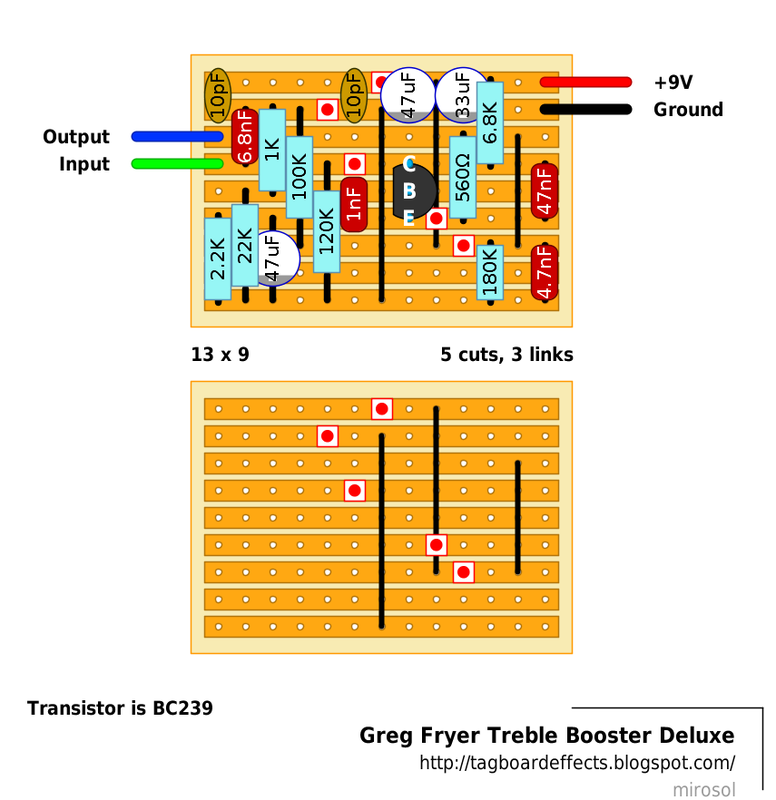 Baby Pink Booster doesn't have a True By Pass but a very well designed Line Driver (buffered output). 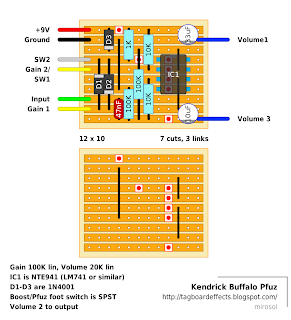 It is good to have one pedal with buffered output or you would loose some signal and high end even with best cables if you drive two cables and few short one between pedals. Request. 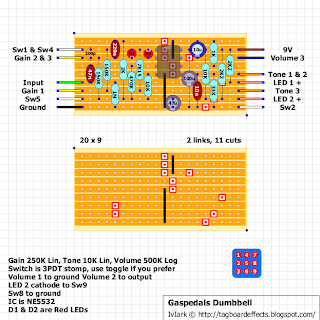 This is a demo of the single knob version, the layout is for the 3 knob version. -Heavy bottom. Rich harmonics. High tone which is not too peaky. 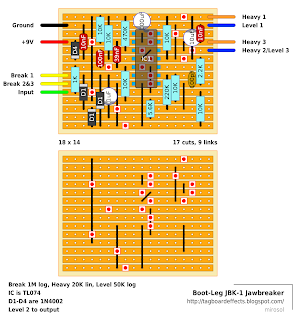 JBK-1.0 is what all guitarists have been waiting for. 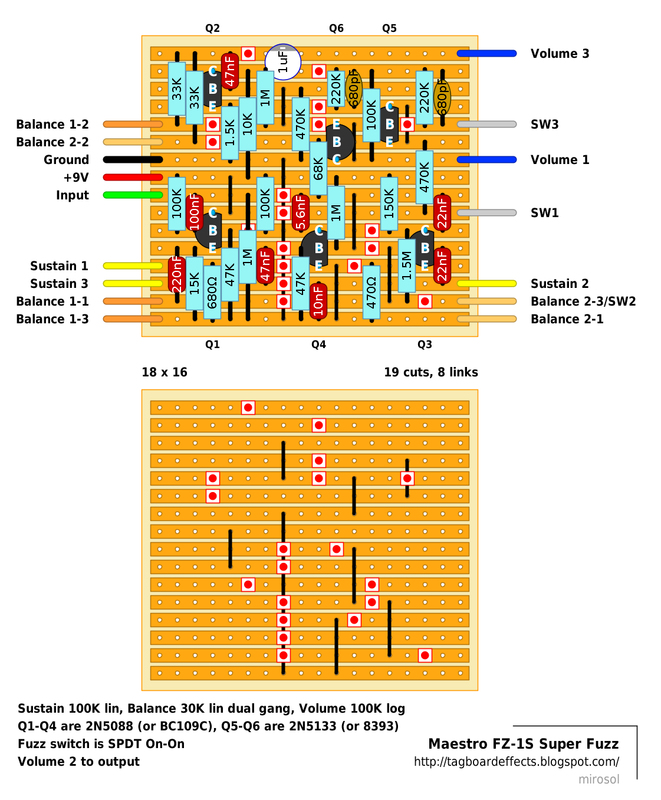 In today's music scenes, players are often required to make all kinds of sound with given amplifiers. 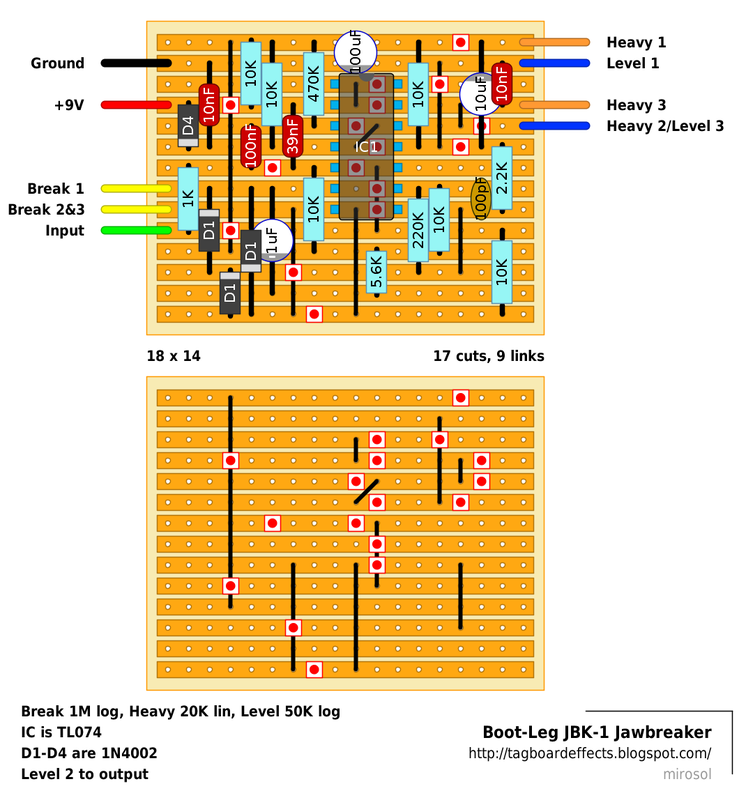 JBK-1.0 will help you in such situations. -It covers quite wide range from soft and delicate crunchy overdrive to rock-crushing hard overdrive. Set it as a hard driver with a clean setting amp. Set it as a clear booster with a overdrive setting amp. You will feel sharp sound coming out of the P.A. system at your body. 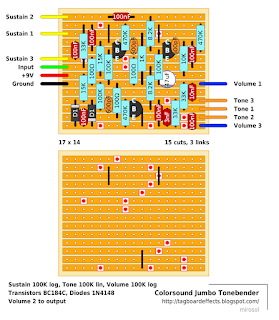 -Today it is naturally required for professional guitarists to control the color of sound with adjusting the guitar volume. You are lucky! With this JBK-1.0 you feel as if you were controlling the distortion directly with your guitar volume. -Try it in loud, anyway. You can get the chopping sound even with a clean amp. You can also adjust the "HEAVY" knob to change that chopping feeling. -This new lineup of Boot-Leg, JBK-1.0 can be used as an amp simulator. This is a big news! 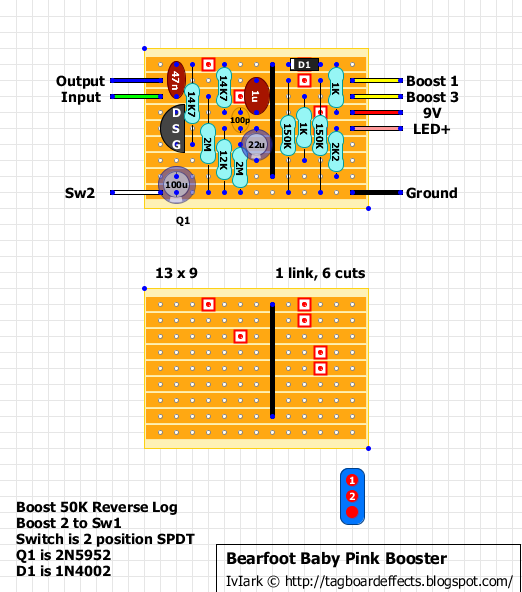 Original design by Dan Green from Commonsound and now a very popular DIY project, this version based on the Tonepad schematic and corrections. 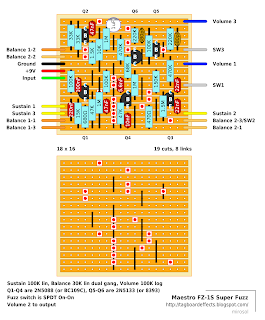 For optional Symmetry pot to give you a sawtooth LFO in each direction, take a feed from Speed 3 and inline, solder in an anti-parallel pair of 1N4148 diodes. 1 of the diodes will go to Sym 1, the other to Sym 3, then Sym 2 links to Smooth 3 or Fine 1 & 2. The 4ms versions removes the Fine pot if you opt for the Symmetry pot, but there's no reason you can't use both if you want to. The Symmetry pot would be 500K. The LDR ideally needs to be wrapped with D1 (black heat shrink tubing is great for doing that) or at least mounted facing each other. I purposely placed only links and thin leads between the two components and I have left enough separation so they can lean into each other, lie flat and be wrapped comfortably. Young grasshopper: to feel the boost, you must learn the way of the tiger. To feel the tiger, you must learn the way of the boost. 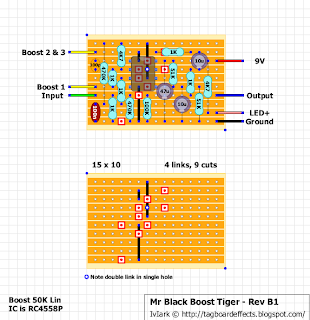 Roaring out over +20dB of powerful, clean tiger-boost, the Boost Tiger breathes life, vigor and super-tiger-powers into your tone. WARNING: This pedal is extremely powerful. Mr. Black is not responsible for any damage to other pedals, amps, guitars, ears, people or medium to large prey affected by its use.
" Powerful, rich, good treble detail"
• Evokes the BM sound of mid 1970s Queen albums "Sheer Heart Attack", "A Day At The Races" and the Brian May 1980s live concert sound. Death is Gain - Low to Medium Gain Overdrive. This pedal is an articulate overdrive that is very responsive to pick attack and playing dynamics. The controls and circuit on this pedal are familiar, but the end result is anything but. Modern adaptation of the classic Fuzz Face. 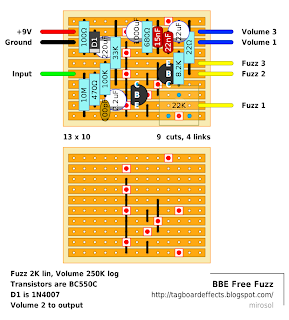 Nothing too special about the circuit, except for the fact that it uses biasing methods side by side with the fuzz pot. 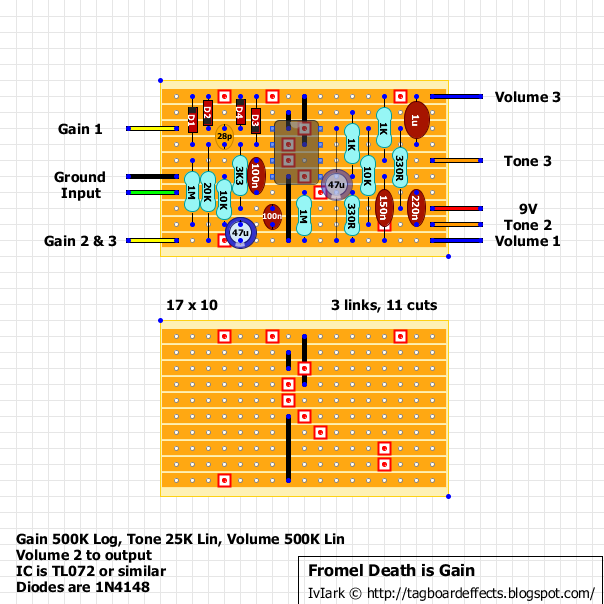 Original units have two resistors in parallel from Q2 emitter to ground, but i've replaced those with a 22K trimmer for this layout. There's a lot of power filtering going on, and i suspect that the 1000µ may be a slight overkill. You could omit it altogether or try something like 470µ, 220µ or even 100µ in its place. 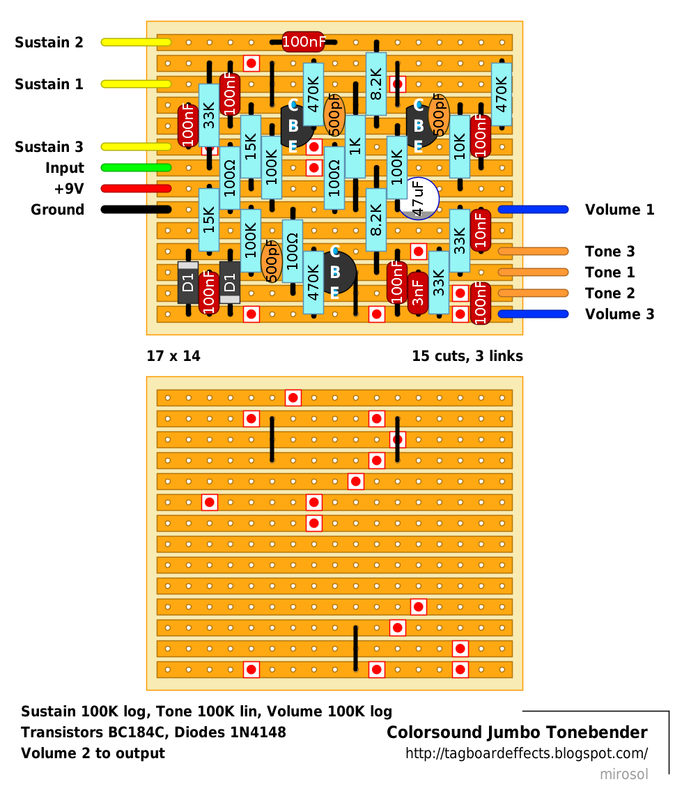 A few people were after this one and as it's pretty close to Colorsound Bass Fuzz, i decided to tweak the layout for a Jumbo. Notes on Phillip Bryant's schematic note that this circuit is apparently 1:1 with Colorsound 3-knob Tonebender re-issue..
A firm natural overdrive with a pleasant silky sustain. An easy to handle overdrive with great sustain without any unnatural compression. 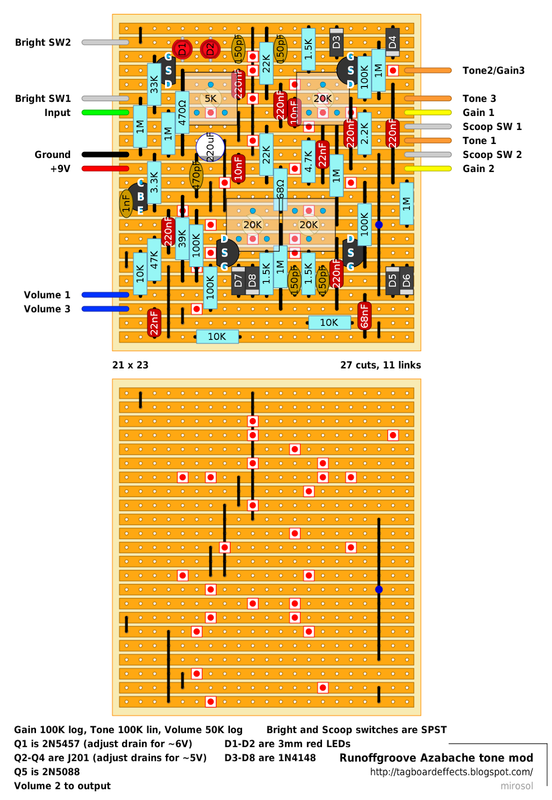 It keeps the characteristics of the tones that the guitars naturally produce. The Jan Ray reproduces that great sustaining punchy clear tones of the blackface Fender amps from the 60's. The tone is crispy yet the low is warm and mellow. And it only costs £300 here in the UK for a blatant rip off! Bargain! And so I strongly suggest anyone considering buying one gets themselves a Timmy instead or makes their own. I like the compressed setting on the Timmy and so have added an updated layout which includes an additional switch to choose between compressed and uncompressed symmetrical clipping. One of the often overlooked Fender amps is the tweed-era Princeton. They are excellent guitar amps, especially for blues playing. The major drawback was the 4.5 watt output wasn't enough to keep up with a band. Again, using the technique pioneered by Doug Hammond, we decided to try to capture some of the sound of this little amp in pedal form so it can be used with a band. 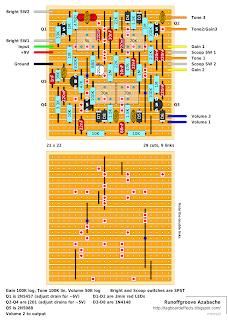 The circuit we chose is the 5F2-A Princeton, one of the so-called "narrow panel" amps produced from 1955 to 1960. It was a very simple amp, using one 12AX7, one 6V6 power tube and a 5Y3 rectifier. Since we used 9V DC power, we left out the 5Y3. 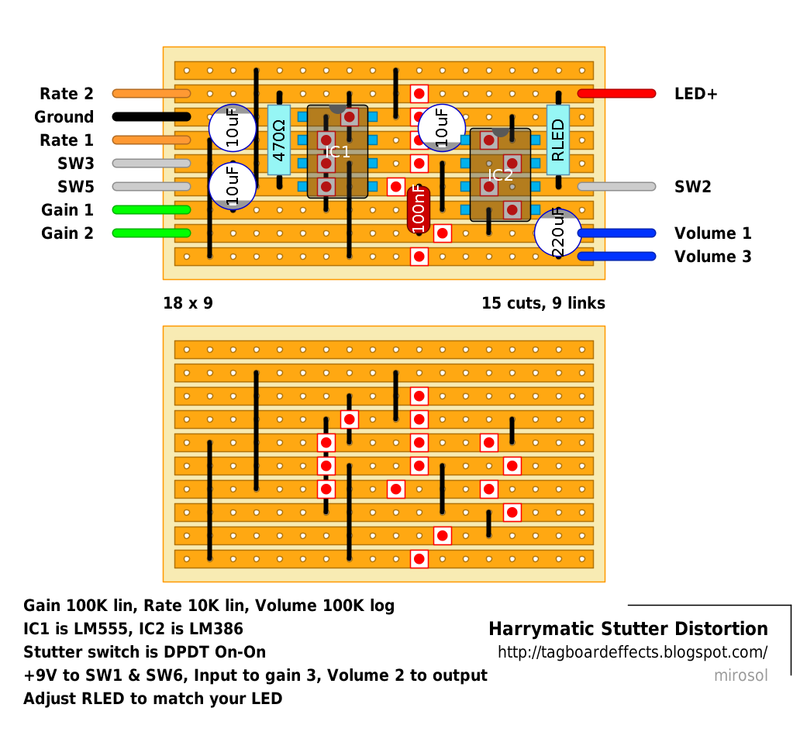 We used JFETs to replace the two halves of the 12AX7 and the 6V6 power stage. 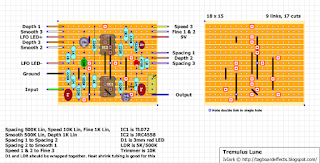 We took the 5F2-A schematic and copied it part for part using MPF102 JFETs in place of each tube stage. 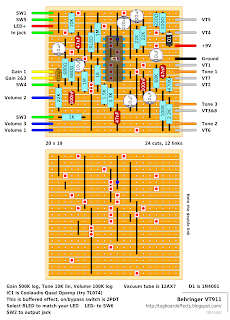 Each tube Grid was replaced by a JFETs Gate. 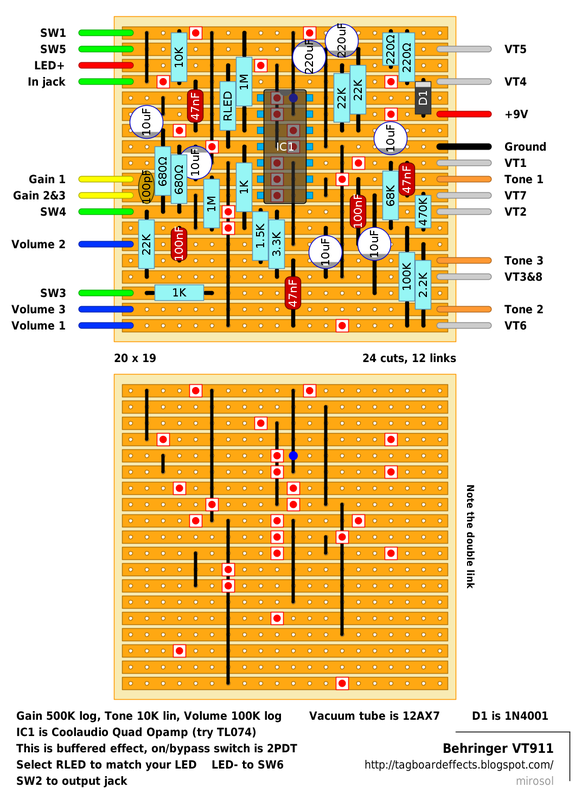 The tube Plates were analogous to a JFET Drain. Finally, a tube Cathode was replaced with a JFETs Source. 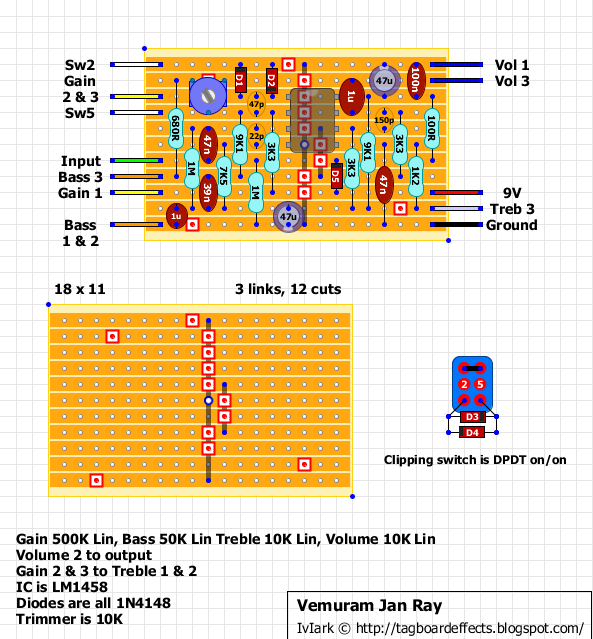 We used a 100k trimmer for the plate resistors on the schematic due the fickle nature of JFETs and the much lower power supply involved. 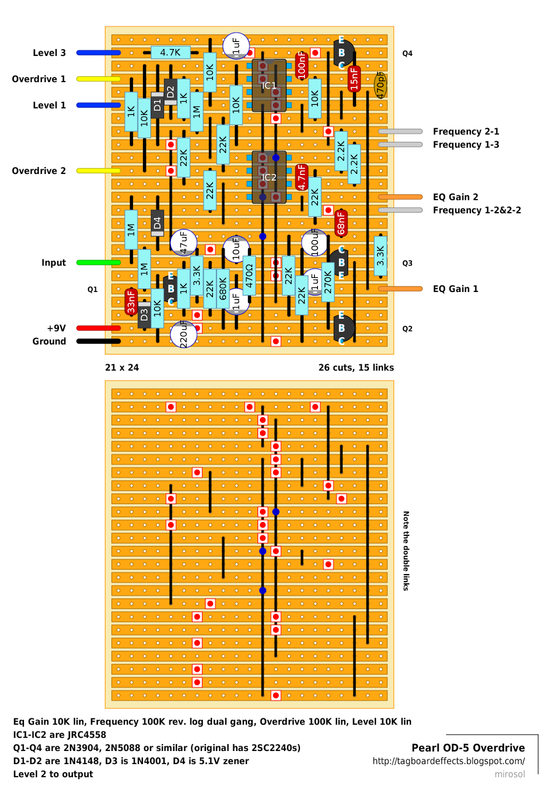 Our "artistic license" is in the choice of the last JFETs output cap and the setting of the dual Low Pass Filters. Our goal was to produce the sound of a Jensen speaker. 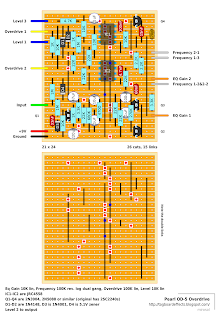 These are typically a little broader in frequency response than something like a Celestion. 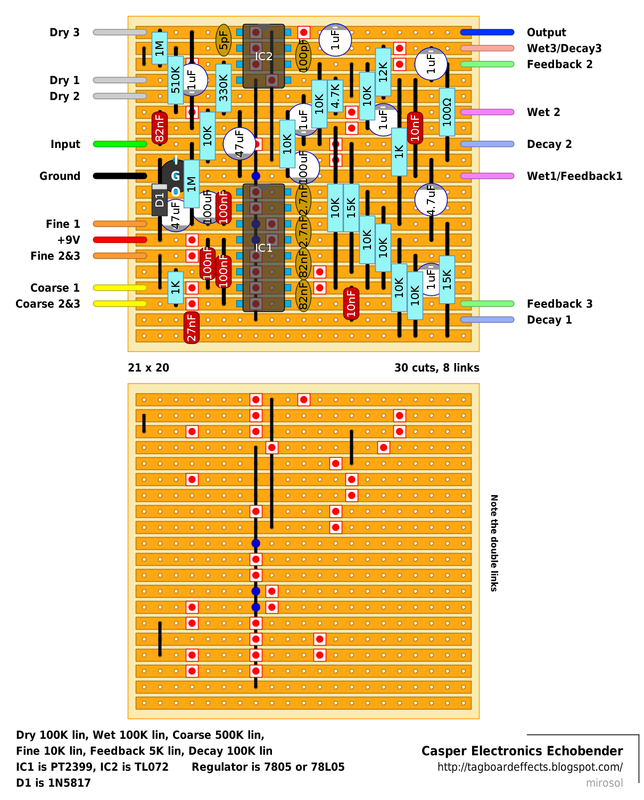 Using all MPF102 JFETs, there is a great range of sounds available. No, you won't be playing "South of Heaven" with this pedal, but some classic blues, country, surf and rock sounds live here. The cleaner sounds are compressed and have an edge to them. As you wind up the Volume knob, you'll hear the dirt level increase. At full Volume, there is plenty of nice overdrive that never loses its dynamic feel. Even at full tilt, the circuit can clean up very well. Try using a J201 in the first stage. You'll notice the overall available gain increase and the sound will darken a bit. We preferred the sparkle of all MPF102s, but if you use sockets (as is always suggested) for the transistors, you can experiment until you find the combination you like best. Socket the cap in the feedback loop. It is the 1uF cap connected to the output cap on one end and the 22k feedback resistor on the other. In this socket, try any value from 2n2 to 1uF. 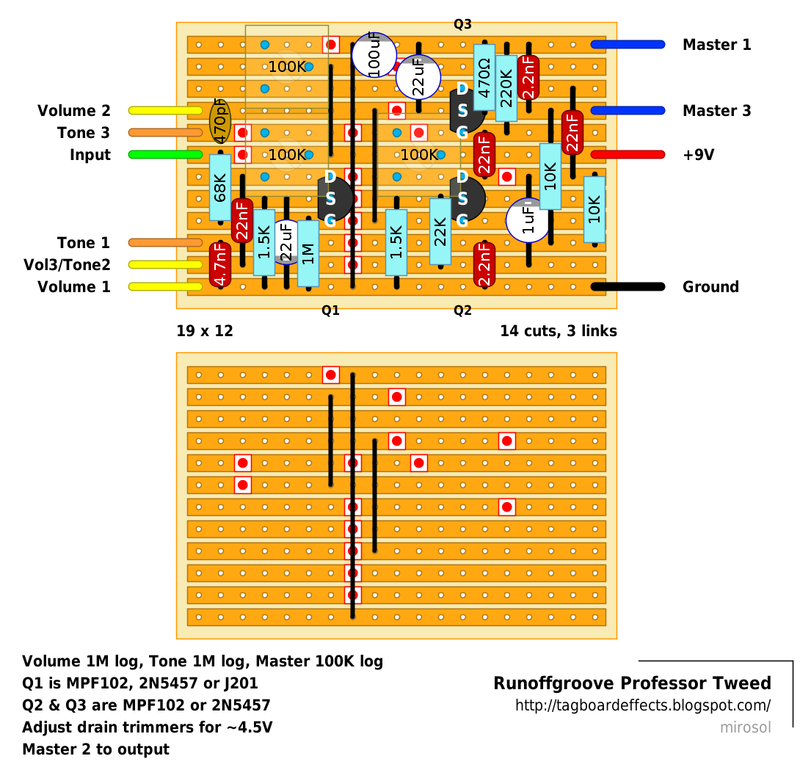 The sound will "open up" most around 10n and will "close up" as you get closer to 1uF. Try different values here to find the sound you like most. 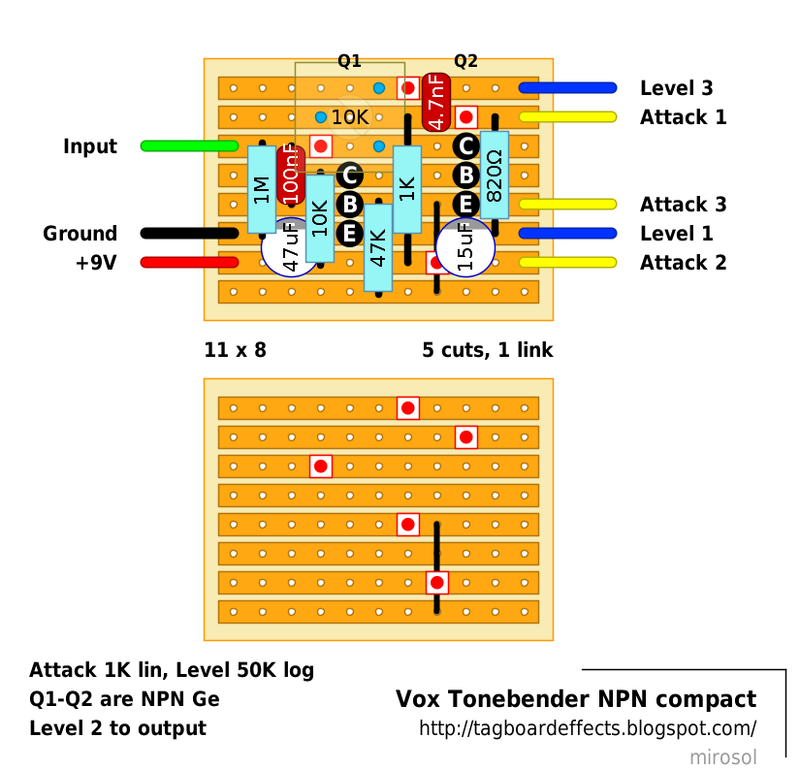 Another possible area for modding would be the Tone control, specifically using different values for the 4n7 and 470p caps. 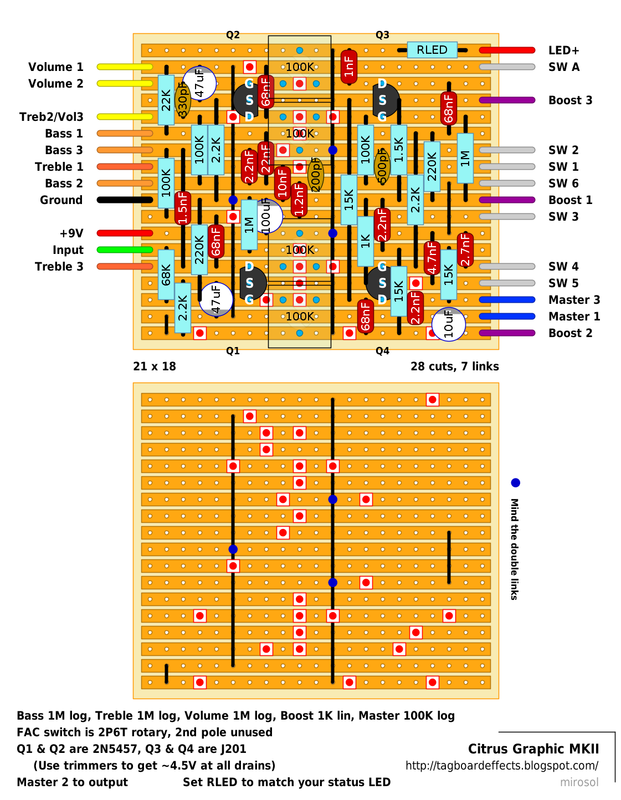 The Tone control works well in its stock form, but you may find something interesting by substituting different values here. I was doing a request, and this one was so close to the one requested, so i thought i'd draw it up too. 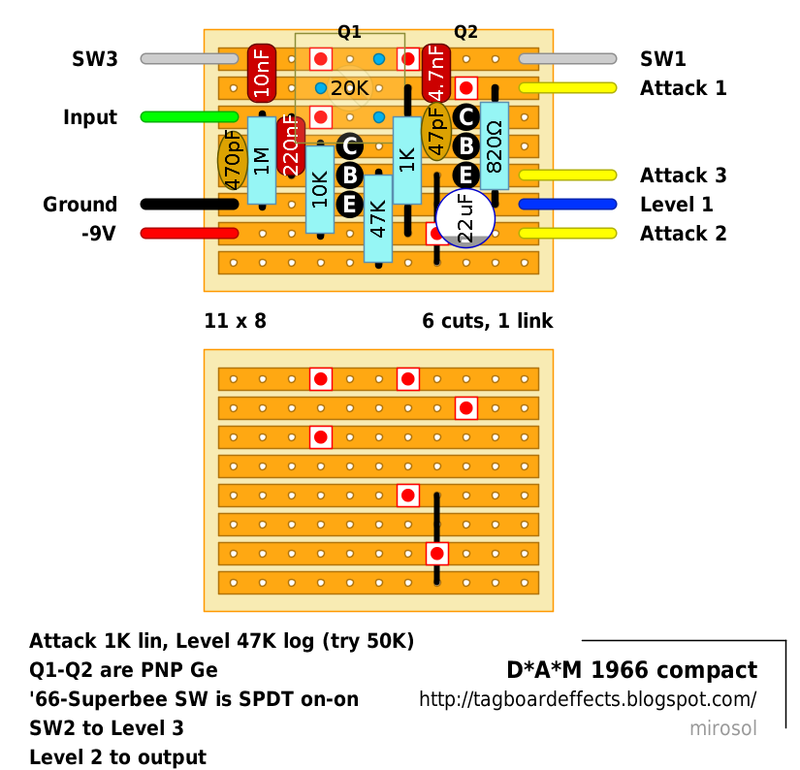 Mark has published this in the past and that one fits easily in B, but the one i'm posting now should be doable even in A... :) This also features a trimmer for nailing the bias just right for your transistors. It may sound a bit thin to someone's liking, so upping the 4n7 for 10n, 15n or maybe even 22n would give you much more bass responce. We are now making these in our own cases, as the Analog Man Sun Face . They are hand-built in the USA in small gold boxes, with our own USA made SUNFACE circuit board, which was made small enough to fit in almost any enclosure. 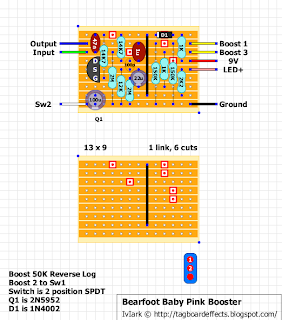 As you can see in the picture down below a bit, this is a VERY high quality board of the same type used on our other pedals. It is better quality than almost any other fuzzface clone you will find, with shielding, plated through-holes, etc to meet military specs. It also has an internal CLEAN trim pot (white knob). This trim pot acts just like turning down the VOLUME knob on your guitar, to clean up the fuzz. It can be used to preset the sound as with the volume knob rolled back a bit. It also allows easier control of the volume knob on your guitar when the white CLEAN trim pot is turned a bit. 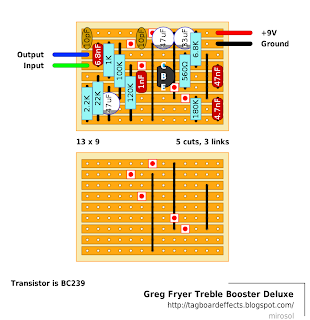 It can also be used to kill Radio Frequency Interference, which may be a problem on high gain pedals in some areas, by turning it down a hair. 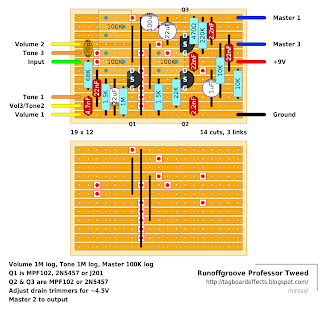 like all our handmade pedals, the Sunface has true bypass, so when off they do not alter your sound at all. The CLEAN trimpot will also allow the sunface to work better after a vintage style wah pedal, without having to use a foxrox wah retrofit. I'd probably suggest using a 10K for the Sundial. 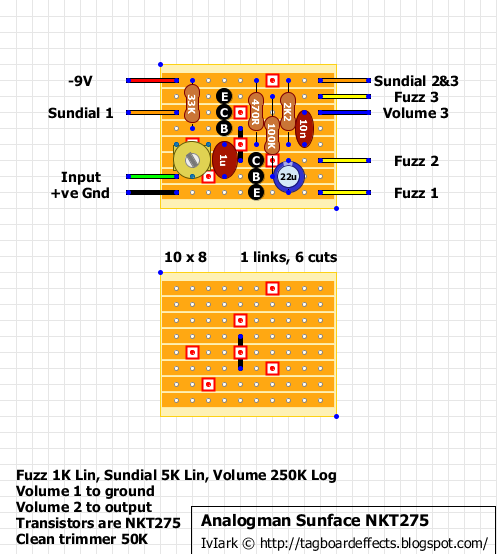 5K + 2K2 doesn't even equal the usual resistor in that position in a Fuzz Face (8K2) and so I think you want to give yourself a bit extra. 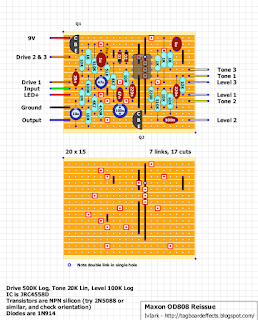 Revised 13-03-2014 to use common single turn trimmer. 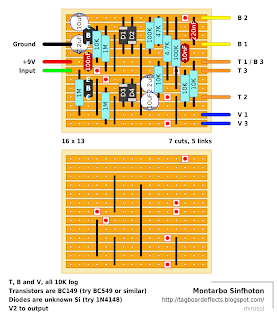 We have some BC108 and BC183 silicon transistors, and have been making silicon Sunfaces for several years now. The BC108 are in small metal cans while the BC183 are plastic. Silicon fuzzfaces came out in about 1969. 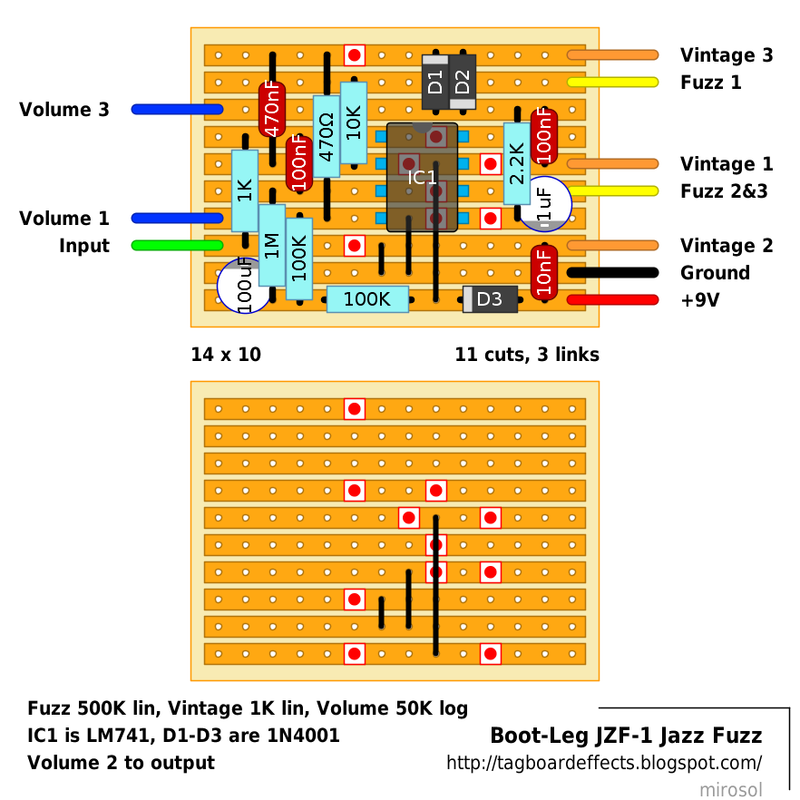 Dallas Arbiter used both of these types in their Fuzz Face pedals. The silicons are fuzzier than the germaniums, and brighter. 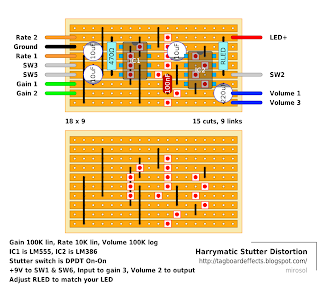 The silicon transistors have much higher gain. They don't get totally clean by turning the guitar down like the NKTs but they do clean up quite a bit and are sensitive to your dynamics. Check out the sound sample below to hear this. 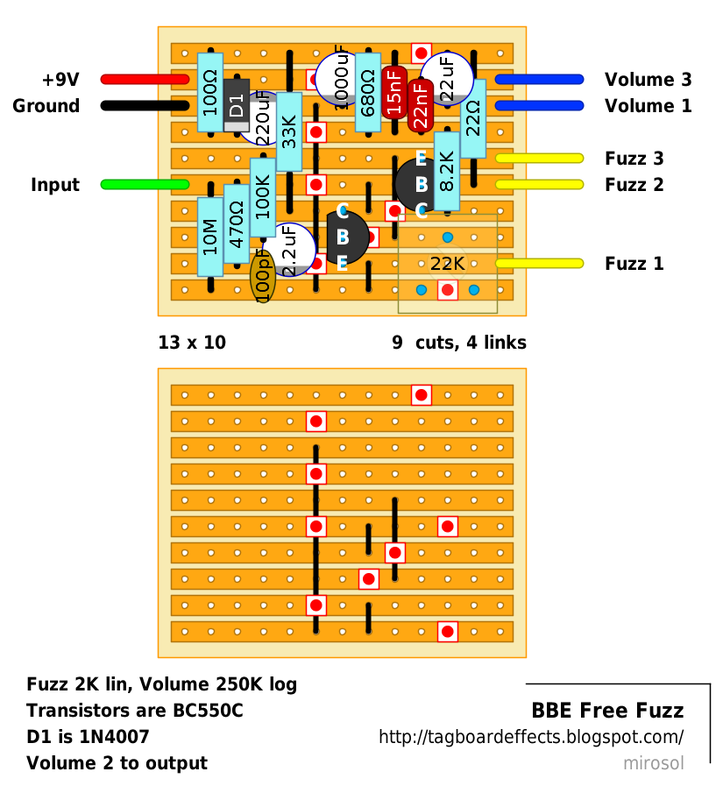 The BC183 transistors we got in 2011 are my favorite for a silicon fuzzface. They are a little warmer than the BC108 and still have plenty of fuzz. We got a large box of these, each individually hermetically sealed in a foil pack, with the same paint stripes on the back that they used in the original 1969 Fuzz face pedals. 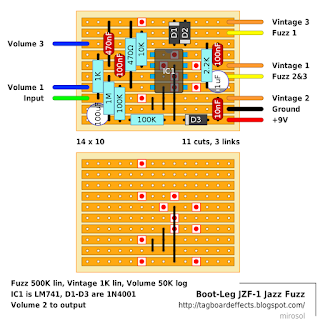 I think Eric Johnson has BC183 in the red fuzzface that he used for years, and the new 2012 Dunlop Eric Johnson signature Fuzz Face seems to use these too. Jon Carin (Floyd, The Who, Roger Waters, etc) contacted me in 2012, looking for a fuzz that sounds like the giant lap steel on One Of These Days by the Floyd. I recommended the BC183 Sun Face for him and I think he likes it!